Warm your arty heart. Winter Solstice is a phase of shorter days and longer nights. There’s plenty of moontime before we head into increasing sunlight. What’s dark and what’s light in your life right now? In this playshop, we foster a safe, non-judgemental space for you to gently go within. Take a look at your current highlights and low-lights and respond through writing or art-making. 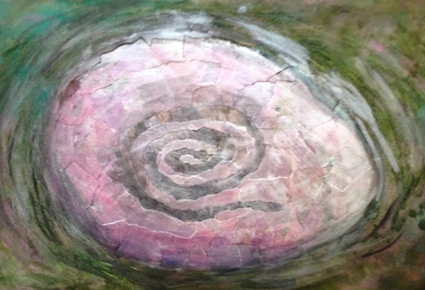 Create a solstice symbol or story of the self. An opportunity for pleasure, release, discovery and deep knowing…and above all – creative nourishment. Ooooo – Art and Soul Sally confesses she is slack about mentioning playshops in this here section of her website. The very best way to stay in touch with workshops and playshops is to sign up to the e-newsletter. Please pop a Yes to the e-newsletter in the Contact box on this site. or subscribe to the fabulous Art and Soul e-newsletter. Sign up to my Art and Soul e-newsletter for more details. You can do this by popping a message in the Contact box. how’s this for an unsolicited rave review? I am so sincerely grateful I came along to my first “Art & Soulie” experience with the theme of Creative flames. I don’t usually indulge in time for myself so it was such a treat to have an experiential guided meditation along with your presence and your encouragement for us to connect with our emotional part of ourselves and our own truth. I have heartfelt gratitude that you made a space to nurture free expression in our art, material choice and emotions too. I appreciate your attention to detail in the rituals, from the tibetan singing bowl, to verbal sharing of our art with invitation for group feedback. It was a memorable journey to experience free expression and vulnerability. I can’t wait to come along again. I found it rejuvenating, heartwarming & soulful to be in your creative flames workshop! What nourishes and supports your sense of well-being? How might you tap into your inner wellspring of creativity? You are welcome to enter a peaceful, safe space; to tune into creative impulses and let yourself play via art materials and journalling. Feel free to create a picture of full health for ongoing growth and enjoyment. No art experience is necessary – Where we are is where we begin. There have been several Art and Soul playshops in 2017 which haven’t found their way into this website. They get mentioned in the Art and Soul e-newsletter, but rarely make it here. All the more reason to sign up for the newsletter, if you wish to come along to a delicious heart-art opening inspiring session. Find your space. Make your space. Connect with an inner or outer place that is safe, peaceful and meaningful to you. It may be imaginary. It may be from the past, present or future. Play with paint, crayons, words, collage, threads, papers to create your sanctuary – your heart’s touchstone of rest, renewal and refreshment. Numbers limited for maximum safety and nourishment. How are you as we head towards the end of the year? Would you like a gentle holding space to simply BE? towards Christmas and New Year. or $80 AUD each if you bring a friend/colleague/family member. or go to Contact menu in website. What’s growing in the garden of your heart and soul? What’s flourishing? What’s dry or bedraggled? Do you see bees, butterflies, slugs, scaley stuff? How might you cultivate seeds of nourishment and joy? 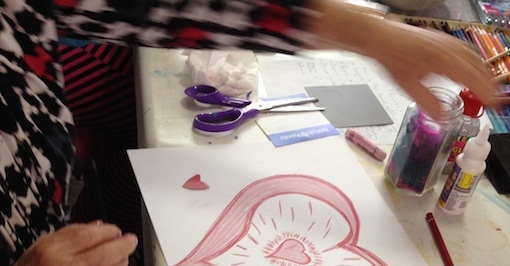 Why – through being in a safe space of awareness, art-making and journalling, of course! and to connect deeply with yourself and others. let’s water those plants of play, peace and purpose. is on Saturday 6th August. How might you be light-arted? Spend a morning in a cosy, safe space playing with art materials and journalling. Create pictures to help sustain you through the heart of winter and beyond. Small group for maximum soul nourishment. but if you are out-of-sorts, this playshop can help. Tired of being stressed, worried, irritable? Let’s use art, writing and mindfulness to slow ourselves down a little. Let us wend our way into spaces between tight, spiky thoughts. In those spaces, let’s contact our sources of delight and nourishment. We can grow from there. Creative expression is a gentle, powerful way to play (and work) with cultivating calm and strength. No special arty experience required. Simply BYO (Bring Your Openness). $90 AUD includes art materials and morning tea. $80 AUD each if bringing a friend. It’s time to DRAW AND POUR. while you’re sipping, supping, talking. 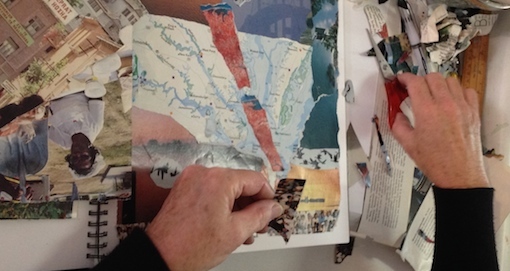 A cuppa, a chat and some art-making. We begin and end with a brief silent meditation. We do our own artplay thing. 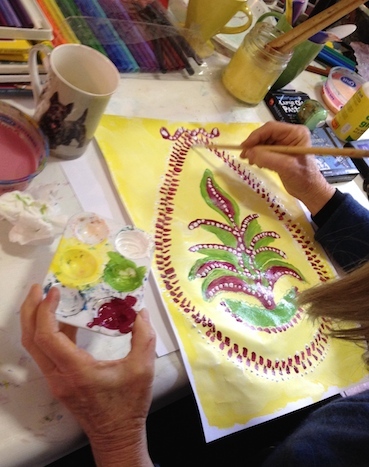 We allow our painting, drawing and conversation to arise as we go. It’s an art circle, rather than a workshop. A bit like a sewing circle, except you don’t have to sew! There’s no particular theme, prompt or exercise. without specific guidance or teaching. Bring your openness to the Art of Emergence and your respect for equally sharing the airspace. Then just follow the flow of your creative impulses. I provide strong, gentle hosting and holding of the space, plus basic art materials and morning tea. $65 AUD only. Eight places available around the table. 2. using artplay processes that are nourishing, soothing and restful in themselves. No art experience necessary to activate these LARAR tools. If this interests you, or if you’d like to stay in touch with Art and Soul offerings, please fill in Contact Box right down the bottom of this page. Or go to Contact page on this website. Is the house of your heart full? The last two Art and Soul playshops were full house. Begin the year by creating a guide to your own well-being. dream into how you’d like to be. We play with collage, writing, crayons, markers, paint and glitter to remember what it is that we love and to generate the new. We tap our embodied wisdom on how to live well. We imagine how we wish to create our year and place our expressions with play, care and freedom into the gentle containment of our very own book – a personalised joy manual for 2016. Art Heart Path on November 14th is fully booked. in a sweet space in Glebe, Sydney, Australia. Please pop me a message if you have any questions about it. Where are you on your journey through this year? What are the qualities of your path at present? Straight? Steep? Smooth? What is your path made of? Gravel? Water? Silk? Jewels? Gently explore where you are right now and where you might like to go. Play with paint, crayons, collage or journalling to create a picture of your heart’s path. No art experience is necessary to be thoroughly absorbed and satisfied. 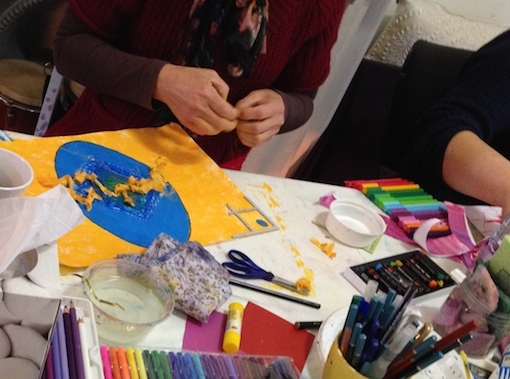 Watch this space for upcoming Art and Soul playshops … humm … what date will the next one be? Colouring Out was a gorgeous Art and Soul playshop. Feel free to find out more, or join the Art and Soul email newsletter. Pop down to the form below. Hope to meet you more fully in cyberspace…or even in person…and to support your creative flourishment. What nourishes and supports your sense of well-being? How might you tap into your inner wellspring of creativity? via art materials and journalling. Feel free to create a picture of full health for ongoing growth and enjoyment. No art experience is necessary – Where we are is where we begin. at an Art and Soul playshop. An Ovala. at an Art and Soul playshop. An Ovala. This participant was so enthusiastic, her hair was swinging. Meanwhile, feel free to join the newsletter community. Colouring In is all the rage. to venture outside the lines…in art and in life? with the aliveness of Original Creative Expression? and making an Ovala (Egg-Shaped Mandala). bringing together the focussed and the flowing; the meditative and the meaningful. 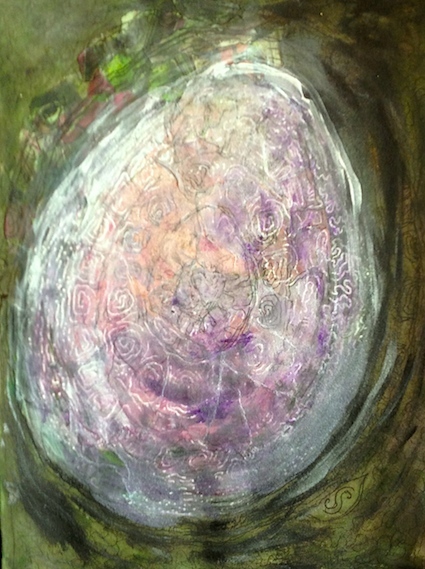 into the joys of art-making as a whole-being activity.